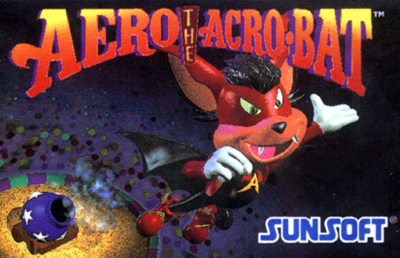 Inspired in part by the "mascots with attitude" trend that was common following the introduction of Sonic the Hedgehog, it featured a red bat named Aero, who works and lives in a circus. He must defend the circus from an evil ex-clown called Edgar Ektor, who used to work in the same circus and wants it shut down forever. The levels are played in typical 2D platforming, but in order to clear levels, the player must accomplish certain tasks so that the exit warp can be revealed. Those tasks include passing through hoops, step on platforms until they disappear, ride roller coasters, etc. There are 4 worlds with 5 levels in each one, and the levels are large, many of them containing awkwardly positioned spikes that kill instantly. Aero can attack enemies by shooting limited stars or by doing an aerial diagonal drill attack at his target (when he is in the air). During the 16-bit era, Aero had a fair share of fame. Sunsoft used him as a mascot during the 16-bit console days.